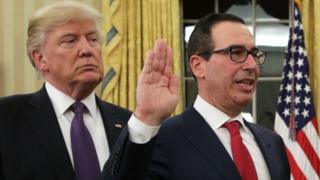 US Treasury Secretary, Steven Mnuchin, has promised "very significant" tax reform before the Congressional break in August. In his first television interview, since taking office Mr Mnuchin told CNBC his priority was boosting growth. Mr Mnuchin said that tax cuts combined with deregulation would boost economic growth to 3% by the end of 2018. He said his team was still "looking at" the subject of a border adjustment tax that would put a tariff on imports. President Trump has promised to announce a "phenomenal" plan to reform the US tax system by early March. "We are committed to pass tax reform, it will be very significant, it's going to be focused on middle income tax cuts, simplification and making the business tax competitive with the rest of the world," Mr Mnuchin told CNBC. He was confirmed as Treasury Secretary, the most senior economic role in the US administration, last week. His pledge to boost growth to 3% falls short of Mr Trump's pre-election promises to achieve growth rates of 4%. However, vows from the new administration to reform tax and cut regulation have been broadly welcomed by investors, who expect corporate profits to be boosted by the new policies. Share markets have jumped since the November presidential election in what has been dubbed the "Trump rally". Mr Mnuchin, who also appeared on Fox Business Network, said the idea of an additional tax on goods coming into the US was still being studied. "We're looking at it seriously, there are certain aspects of it that we're concerned about, there are certain aspects that we like," he said.